My confusion over the tight braid cable made me put the whole Master Hand Knitting project aside for a couple of weeks. I wasn’t ready to call it quits on that tight braid (Swatch #15, first attempt), and yet I wasn’t able to find a solution to make it better. I even dolefully tried to finish it knowing that I wouldn’t like it. This was a non-starter. I guess that makes me a true “product knitter”. I can’t stand to work on something knowing that I won’t like the results and that it will serve no good purpose. I have finished knitting Swatch #1. The ribbing section has a little distortion on some of the stitches, but I’m thinking (hoping) it is minor enough to block out. I haven’t yet woven in my yarn tails, as I wanted to first read up on the duplicate stitch method of hiding tails which seems to be the preferred method of the TKGA. Their “On your way to the Master’s” articles are incredibly helpful. I never really bothered to figure out what I should really do with yarn tails. I would just take up the darning needle and poke it around a few times on the back of the work until “secure” (“secure” is the universal euphemism all patterns seem to use for what to do with the tail). Now I have read TKGA/Cast-On’s “What to do with those pesky yarn tails” article, and I feel so much smarter about finishing! They had great pictures too where they wove in tails with a contrasting color of yarn so you could really see where the yarn goes and how well it is hidden on the right side. 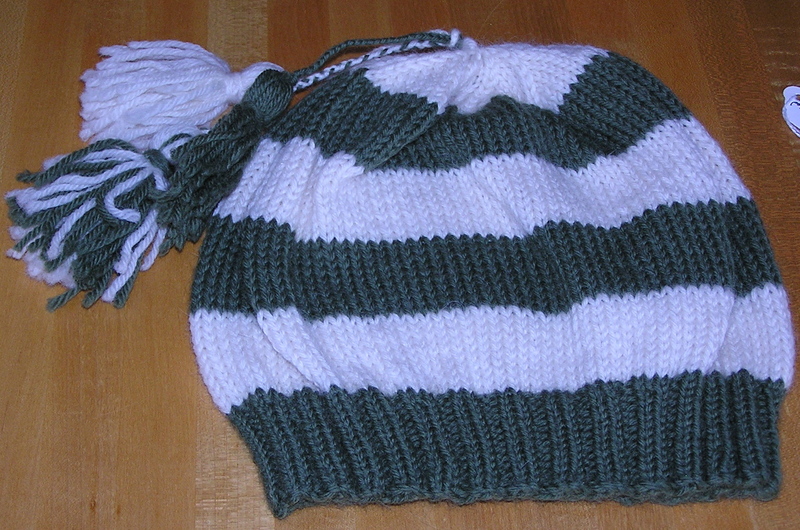 It turns out to that a carry-and-catch-behind method for hiding yarn tails is acceptable in complicated colorwork (ie. Kaffe Fassett), which is funny, because I thought I had made that method up as a lazy way to “secure” the cast-on ends so I wouldn’t have to go back. I believe they call it “spontaneous diffusion” when the same idea occurs to multiple people in multiple places without exposure to one another.